Did you choose a program? Contact a training counselor. The most serious and reliable measurements in the world of the quality in management education place our programs in preferential locations. We are the leading business school in Peru and one of the first in Latin America. Know what the rankings say. Giving Peru international prestige. Graduate education quality and excellence. The quality of the teaching we provide you is reflected in the many awards that the academic worlds most prestigious accreditation and certification bodies have given us. These distinctions guarantee the highest quality academic and administrative management processes. Only 1% of schools worldwide can offer this distinction: the three most important in quality education accrediting bodies for business schools attest to our excellence. Here they are. The Association of Advance Collegiate Schools of Business is made up of educational institutions, companies and organizations around the world that are committed to improving the quality of business education. It is the oldest accreditation body and it awarded us the distinction in 2010. 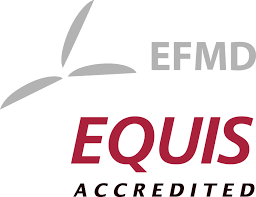 It is awarded by The European Foundation for Management Development (EFMD), a global organization composed of academics and executives from business schools. It evaluates the quality of MBA programs, masters, doctorates and executive education, and accredited us in April 2011. In 2017 we obtained the re-accreditation. The Consultative Council of The Association of MBAs certifies only the worlds best Masters in Business Administration programs. We received this award for all our MBA programs in December 2004, for our DBA in 2010, and we obtained reaccreditation in 2015. The design, development and management of our graduate programs (masters, doctoral, PBA and diploma) as well as executive education and in-house courses, are ensured by international standards. In 2003 we obtained the ISO 9001: 2008 and in 2015, we became the first business school in the world to be certified in the 2015 version of ISO 9001. Certificate. We developed an integrated management policy, which includes the continuous improvement of our environmental management system under ISO 14001:2015 international certification, obtaining achievements in the improvement of environmental performance, improved relations with the community and development of a culture focused on prevention and continuous improvement. Certificate. We respond to Guide for Social Responsibility ISO 26000:2010. We are the only business school in Peru that has this mention, under which our academic and administrative processes are developed according to good social responsibility practices that harmonize with our community and stakeholders. Check letter. 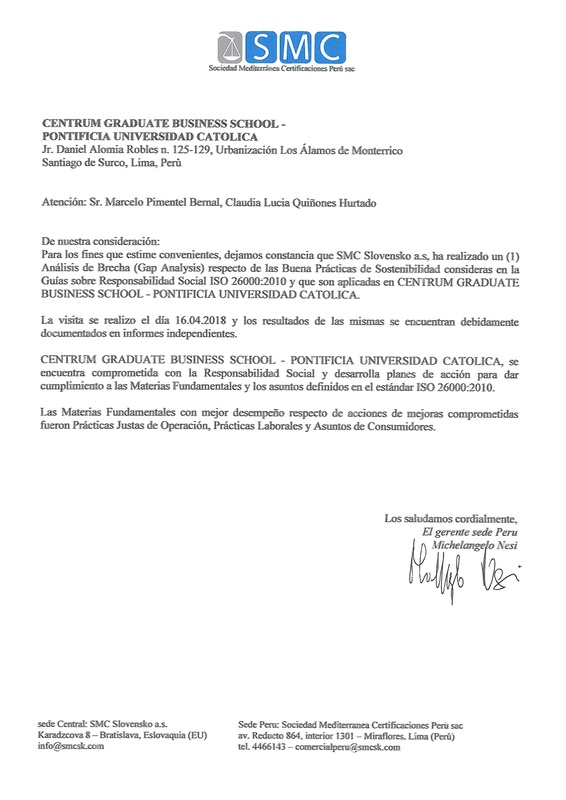 CENTRUM Católica is considered in the Corporate Reputation Ranking 2016 by Merco consultancy. This measure assesses how stakeholders observed companies, regarding compliance with the values and principles that promote within their social responsibility policies. Check out the full ranking here. CENTRUM Católica is ranked 34 in the ranking. This important location is a sign of high reliability that we have towards our customers and corresponds to the policy of providing an education of the highest quality, low ethical principles in the way of doing business, expressed in an appropriate environment, high investment in our human resources and harmonious relations with our partners.